Holcombe coach and captain accept Cheevers trophy. Congratulations to Holcombe HC who capped off a brilliant pre-season by claiming the Nigel Cheevers Memorial Tournament trophy for the second time with a defiant 4-0 victory over hosts Cookstown. Cookstown had started the tournament with a 2-1 victory over Pembroke Wanderers on Saturday before Holcombe came from behind to beat the Dublin side 3-2 on Saturday evening in a brilliant game under the lights. This meant that it was winner-takes-all on Sunday afternoon as the Tyrone and Kent men met at Steelweld Park. The first half was an evenly poised affair with both sides having chances and getting into good positions on the field. Holcombe opened the scoring from the short corner set piece just into the second quarter when Robert Field lashed the ball into the bottom corner. Nick Bandurak almost made it 2-0 but Josh McCabe in the Cookstown goal made two excellent saves from his initial flick and from his point-blank follow-up. McCabe was called into action soon thereafter when Field showed an amazing turn of speed on the deadball line to win a penalty corner. The Irish U21 keeper turned Field’s drag over the bar. However, there was no saving the strike that put Holcombe 2-0 up. A great break down the right saw the ball spill to Bandurak and he rifled it home seven minutes into the third quarter. Field’s second goal made that strike look positively timid just two minutes later. He picked up the ball on the edge of the circle and thumped it past McCabe for 3-0. And with five minutes remaining in Q3, Bandurak claimed his second, finishing off a fine attacking move by James Davies and Conor Caplan. Good luck from Cookstown to Holcombe and Pembroke as they start their respective league seasons this Saturday against Brooklands and Lisnagarvey. Cookstown III had a great start to the season with a 7-4 win against Queen’s University II at The Dub in Belfast in the JL2 League Cup. Gareth Cuddy scored a hat trick. Kilkeel III were the visitors to Steelweld Park and were beaten 3-0 by Michael Millar’s Cookstown IV. 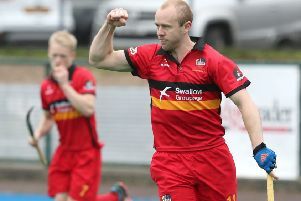 Mark Wilson scored a double and the returning Philip Barbour claimed the third. Cookstown will kick off the season with a virtual must-win as they are visited by newly promoted YMCA at Steelweld Park on Saturday. 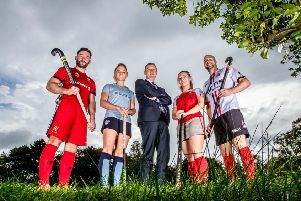 The Ballsbridge outfit were promoted to the EY Hockey League after coming through the Leinster League and qualifiers at the tail end of last season. “I don’t really know much about YMCA but we’ll trust our preparation – we’ve had a great pre-season and hopefully we’ll get the three points,” said Cookstown captain Greg Allen. “Obviously you don’t qualify for the EYHL without being a damn good team and I am sure that YMCA will come out all guns blazing on Saturday. They will certainly be keen to mark their debut in the competition with something a bit special. “From our own point of view, we will have to keep to the high standards that we’ve put in place during pre-season. We have put a lot of running in our legs and I think that will hold to us. I’ve been especially happy with our defensive changes and in Josh McCabe we have an outstanding goalkeeper.